Island View Beach House offers beach living at its best. This villa is built directly on the white sands of Antigua’s west coast with the turquoise waters just a few steps away. You will be hard pressed to find a more reasonably priced beachfront home of this size. With five thousand square feet, five bedrooms and four baths, there is plenty of room for several families to escape from their daily routine and enjoy some island time together. The game room, which has large comfy couches, opens out onto the deck where you will find large hammocks just waiting for you to crawl up into them and take an afternoon siesta. The pool is nice and refreshing for those who want to go for a swim. Parents will enjoy the fact that the kids can play and build sand castles, then switch to the pool and then right back to the beach without having to make a trek back and forth. You are also within walking distance of many amenities such as restaurants, bars, a golf course and marina, allowing the group to get out and explore and enjoy the island. However, beach life at Island View Beach House is so peaceful, you may just want to spend your days enjoying quality family time at your own private beachfront house. The drive from the airport to Island View Beach House is approximately 25 minutes. Beautiful beach house with private swimming pool! This amazing beachfront villa, a few steps away from the crystal clear waters of the Caribbean Sea, offers a stunning view across the ocean and at the neighboring islands of St. Kitts, Nevis and Montserrat with its still active volcano. The gorgeous 5,000 sq ft beach house with private pool is located on Antigua’s West Coast, in the gated community of Jolly Harbour. Set in a tropical garden in the quiet part of the harbour, it is within walking distance from bars, restaurants, tennis and squash, a marina and commercial center and an 18-hole golf course. This spacious and charming 5-bedroom house can accommodate up to 12 persons and invites with light-filled rooms, tasteful and comfortable furniture and a wide range of amenities. The arch-like entrance with three adjoining verandahs leads to a cleverly designed dining room and courtyard area. Open air in the middle, two roofed corridors to the left and to the right show you to the first set of bedrooms. Two of them include en-suite bathrooms, two share an ensuite bathroom and offer pleasant luxuries such as rainwater showers or an oversized bathtub. A lot of care and attention to detail has gone into the decoration of Island View. The result is a special and very charming atmosphere. Some of the highlights this beach villa offers is a beautiful gourmet kitchen and a master bedroom with double shower and large soaker tub. There is a living area with cozy, oversized furniture, large deck and private pool, a hammock and a BBQ grill. 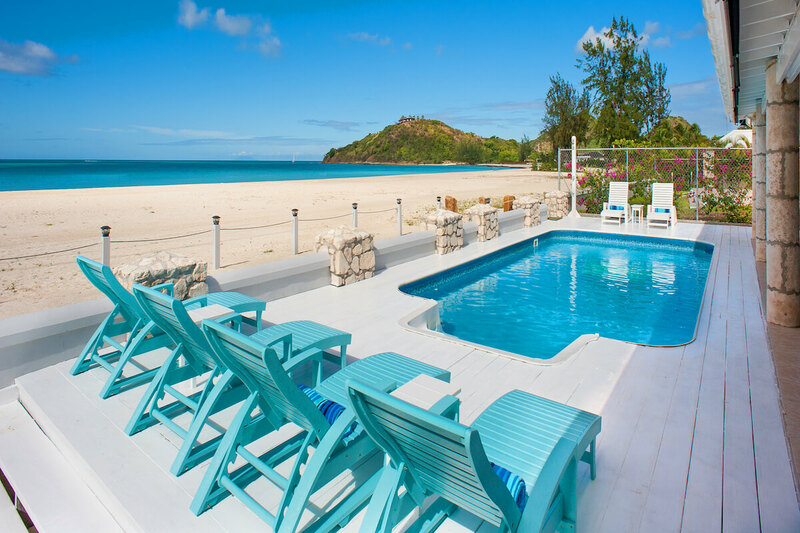 Island View is the perfect get-away for friends and families who want to experience their Caribbean Dream Vacation in the privacy of a vacation home with amenities that leave nothing to be desired. Car Rental Arrangements can be made for delivery to you. Golf carts aren't included however arrangements can be made to rent one and have it delievered to the house. Our group of 12 people had an awesome time at this villa. From the time you enter, the view takes over through the hallway and the living room and continues once you reach the veranda with the pool. It is breathtaking, and one that you can’t get enough of. The amenities in the villa are top-notch. With 2 fridges, 2 stoves, 2 washing machines, and enough pots, pans, dishes, cutlery, and glasses to sustain all vacationers, there was nothing we missed. The extras like the coffee machine, the toaster oven, the margarita machine, and the smoothie machine were an added bonus. The bedrooms are very spacious, and most have king beds. We never used the air-conditioning, as the constant wind kept things cool enough. The location directly on the beach allowed us to step right outside and play beach volleyball, take a dip in the ocean, or just take endless walks in the bay and up the hill on the north end of the beach, from where the views were spectacular. There is a food store a 10 minute walk away, but if you’re buying heavier things, a car is recommended. We had to show ID when paying by credit card. Anyone staying at the villa should try Chef Elroy’s services at least once. We did so 3 times and everything was super delicious. All in all, I wouldn’t hesitate to return here anytime. I enjoyed working with WhereToStay.com and Sharon, the communication was excellent and informative.